It’s hard not to appreciate the 40 S&W cartridge. It’s compact, it’s powerful, and it’s very versatile at the range or for personal defense. Heck, if you reload your own ammo, you can practice with premium hollowpoints for near the same price as your “economy” reloads. Whether or not you carry your own reloaded ammo is a topic I won’t get into here (queue up the lawyers 🙂 ). Since getting my Glock 20, I’ve been eager to reload 40 S&W as it’s been a frequent go-to cartridge for me at the range. Since I’m working on the RCBS Pro Chucker 5/7 series, I thought this would be a great opportunity to pull out the RCBS pistol bullet feeder and show you this bullet feeder working together with the RCBS Pro Chucker 5! This is just one of many different possibilities for die station utilization when using the RCBS bullet feeder on this press. With no dedicated powder check station, one MUST be committed to performing a visual powder level check for EVERY cartridge that goes through the press. Without this diligence, one is more vulnerable to squib loads (no charge) or double charges. I really like the combination of the basic press plus bullet feeder. It’s really nice to be able to keep one hand on the lever, and the other hand manipulating brass. The biggest win is to automate at least one of (bullet feed or case feed). Automating both is even better for throughput, but it comes at the cost of complexity and expense. Each reloader has to decide what’s best for them, and what they’ll get good “return on investment” for. Stay tuned- more Pro Chucker content coming soon! Thanks for the video! Don’t own an RCBS Pro Chucker 5. I do have a Hornady progressive though. I am rather fond of the case feeder and I think their (Hornady) bullet feed die is much better. I do have the RCBS bullet feed die. I have never been able to get 100% on the case feeder but usually it just works with a small hiccup here and there. Don’t have to stop loading just touch a case now and then. If RCBS comes out with a case feeder then I think I would be a nice unit. Think I would swap out the bullet feed die for the all steel Hornady units. They always seem to work without excessive case mouth bell. The Pro Chucker 7 looks to be the more interesting unit. Just need more income for that. Again, thanks for the videos. 40 S&W is easy to reload for. I run Glock 22’s. And with the continued hoarding of 22 rimfire ammo…might as well reload and shoot my 40 S&W. It is still less expensive to shoot 45 ACP than it is to use up 22 ammo let alone find 22’s. Cast your own bullets if you’ve got the time…that saves a whole lot of money vs factory bullets. I chrono my 40 S&W loads at 950 FPS using 170 grain cast bullets…not bad at all! Just as a slightly off-topic note, in reloading range pick-up 40S&W brass I tumble them and then check for the “Glock bulge”. A solution I found to work very well to iron out the bulge is to use a Lee crimp die, minus the crimp tube, and a Lyman 40 caliber top punch. 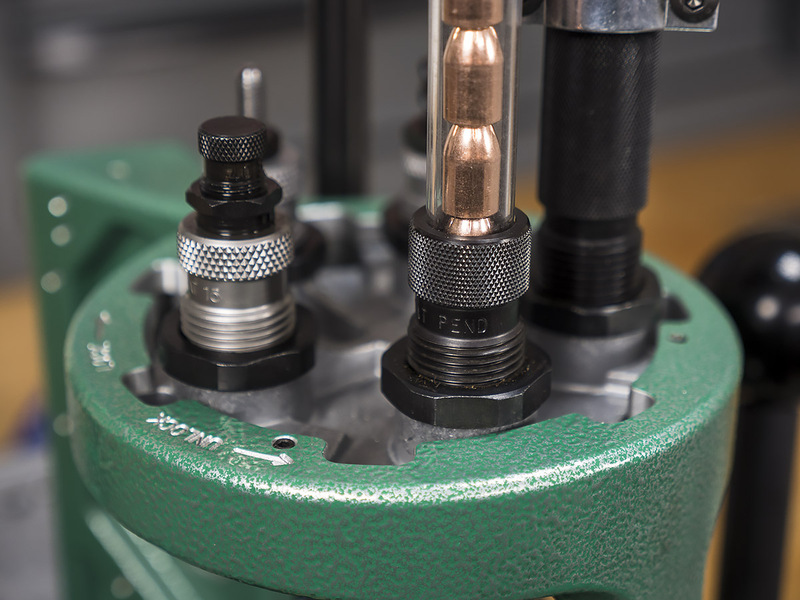 The 40 SW brass being the same diameter its full length will pass completely through the crimp die’s carbide sizing ring and the top punch pushes on the base below the extractor ring. Some brass, Winchester in particular, has a very slight rim that does pass through the die but with a slight “pop” as it is not exactly the right diameter. I do lube the cases for this so they are as slippery as possible going through the carbide ring. Thanks for the great videos on reloading and the wonderful gear that’s out there. Just wondering, did you specifically not use the Powder Through Expander die because you wanted an All RCBS line up and not go Frankenlöder on us this early in the series? Of course this is fodder for future videos about making ‘room’ for the Powder Check die. I have to admit that I have not loaded .40 cal due to the “Glock bulge” and fear of a Ka-Boom (as I have a Glock model 22). Besides what SteveD says, Redding and Lee offer sizing dies to address the bulge. This video has encouraged me – I shall give it a go. Great- the Redding GRX works good!